There is good news and bad news for fans of the husband-and-wife author team known as Nicci French. The bad news is that their long-running series featuring consulting psychologist Frieda Klein is ending. This is not entirely unexpected, given that the title of the introductory book was BLUE MONDAY and the names of subsequent novels have proceeded in an orderly fashion through the week. The good news is that the series is not concluding with the newly published SUNDAY SILENCE, which is intended to be the penultimate title, to be followed in the summer by the grand finale. If this latest effort is any indication, Team French intends to leave Frieda’s London on a creative high note as they continue to constructively tinker in different ways with the structure of the traditional mystery. "If this latest effort is any indication, Team French intends to leave Frieda’s London on a creative high note as they continue to constructively tinker in different ways with the structure of the traditional mystery." SUNDAY SILENCE begins with the grisly discovery of a body buried beneath the floorboards of a living room in a London home. This would be shocking enough in any case, but the home in question is Frieda’s and the discovery is made by her good friend, Josef, the enigmatic construction worker whose presence constitutes one of the many interesting threads that has run through these seven books. The police are brought in, of course, and Frieda ever so briefly becomes a person of interest due to the location of the body and its identity. It becomes clear, though, that the doer is none other than Dean Reeve, the killer who is supposed to have died several years before. Frieda, to the chagrin of the police, has been insisting that Reeve is alive and stalking her, and the discovery of the corpse and some other evidence demonstrates that she has been right all along. However, the news inspires a copycat whose actions are directed at Frieda through those whom she cares about. These actions escalate over the course of the novel, and it is apparent that he is working toward some sort of grand finale for reasons that gradually become clear, but only after his identity is revealed to the reader. 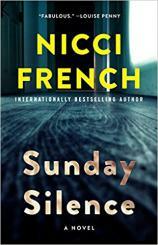 Yes, French pulls off a neat trick here, turning SUNDAY SILENCE from a mystery into a thriller about halfway through the book, with cat-and-mouse elements where the roles keep getting switched. Where does it all lead? The answer to that question is a grand and mysterious last sentence that no doubt will lead directly into that final volume I mentioned previously. This series developed into one of my favorites almost from its inception, and the prospect of seeing the off-kilter Frieda and the wonderful cast of supporting characters --- good, bad and ugly --- fade off into the sunset in the next volume is a sad one. Frieda’s prickly personality guarantees that she won’t leave quietly, but there is a depth to her that hasn’t quite been plumbed yet. Newcomers to the series can and should read SUNDAY SILENCE, then go back and catch up on what has gone before while waiting for the concluding installment. Meanwhile, those who have been aboard this well-maintained train from the beginning will find a cornucopia of reasons to love this next-to-last visit.